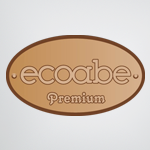 Below we show COABE quality certificates, after being audited by the relevant agencies. BRC Food standard provides a framework that allows the production of safe food products and manage their quality to meet the requirements of customers, mainly distribution companies in the UK. The BRC certification allows us to guarantee transparency and the production process, minimizing food risks, increasing the confidence of our consumers and giving us greater international recognition. 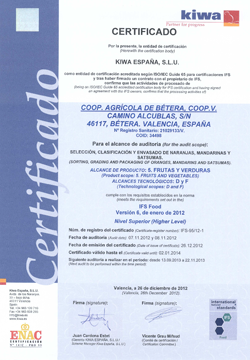 The IFS Food standard is a certification, widely recognized by the major retail chains across Europe, mainly on the French markets, German and Italian and increasingly internationally, for companies where they are processed or handled food products and they want to demonstrate food safety and legality of their products, within a framework of continuous improvement. 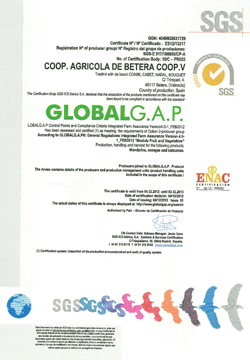 It is an internationally recognized certification, which aims to establish a single standard for Good Agricultural Practice, to ensure safe and sustainable production. 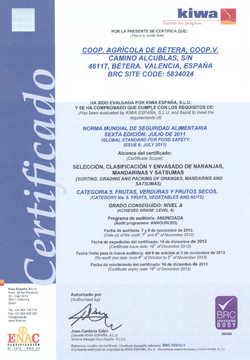 This certificate is a guarantee that food reaches the levels set quality and safety, which have been developed following sustainability criteria, respecting the environment and health, safety and welfare of workers. It is a tool that assesses compliance with labor legislation, both nationally and internationally, and helps producers to establish a good system of social management on their farms, trying to specific topics such as health, safety and welfare of their workers. It offers buyers an additional guarantee and helps protect one of the most important resources exploitation: its people.